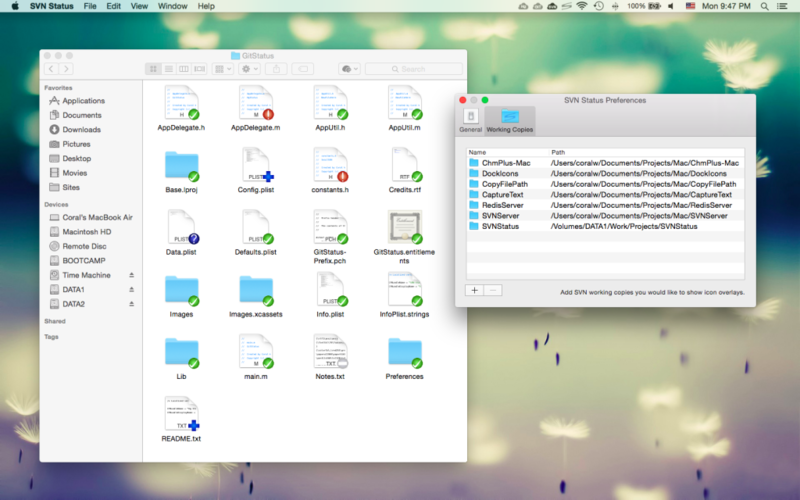 SVN Status adds icon overlays to your SVN repositories in Finder. * SVN Status has been discontinued, please check out our SnailSVN instead. SVN Status tracks your SVN repositories and updates the icon overlays automatically, giving you visual feedback of the current state of your working copies. Q: Is SVN Status a fully functional SVN client? A: No, SVN Status is not a fully functional SVN client, it is designed to show the working copy status only. You still need other SVN clients to manage your SVN repositories. Q: There is no icon overlay for the files? A: Please make sure that you’ve enabled “SVN Status Free Extension” in “System Preferences » Extensions”, and also make sure that you’ve added the working copy to SVN Status. If the problem persists, please disable “SVN Status Free Extension” in “System Preferences » Extensions” and then enable it again. The last resort is to relaunch Finder or restart your computer. Q: Does SVN Status work well with other SVN clients? A: Yes. In theory, SVN Status works with any kinds of SVN clients, from the command line to the GUI apps. Q: Does SVN Status work for file managers other than Finder? A: SVN Status is primarily a Finder extension, so it is likely that it will not work for other file managers. Which versions of svn client and server do I need to have to use properly this app? SVN Status is compatible with Subversion client 1.7 or later, there is no requirement for the server.